You’ve probably heard of Pamplona because of the legendary running of the bulls that happens annually during the summer. You also may know that Hemingway staggered drunkenly through the streets here and immortalized this part of Spain in The Sun Also Rises. 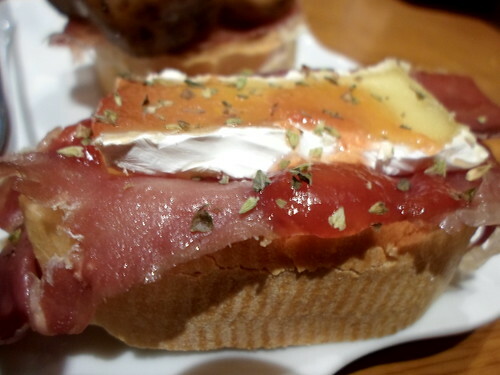 What you might not know is that in Pamplona, the people don’t eat tapas; they call them pintxos instead, and they are delicious, cheap, and abundant. 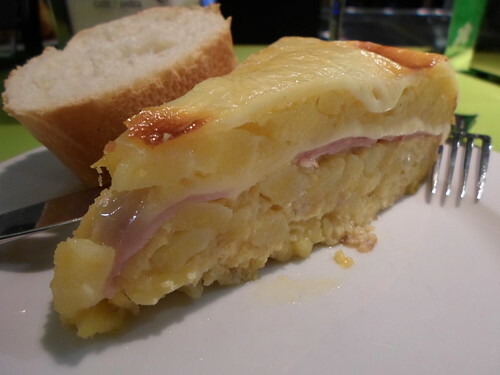 I started with a traditional tortilla of eggs, potatoes, ham and cheese. It came with a crust of bread to mop up the grease from the cheese, and when I finished it I was already starting to feel full! 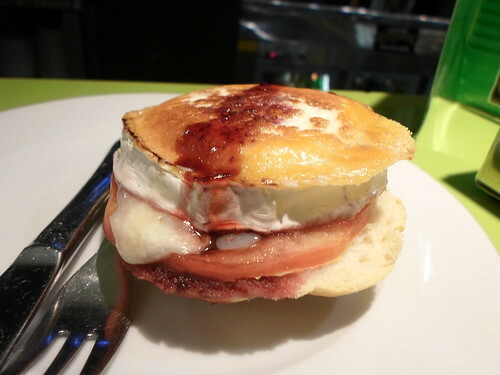 This beautiful pintxo was stuck in the microwave for about ten seconds for the goat cheese to melt a bit; together with a light raspberry sauce and the manchego crisp it was more of a dessert than anything else. The tomato gave it a nice burst of juiciness in the middle. 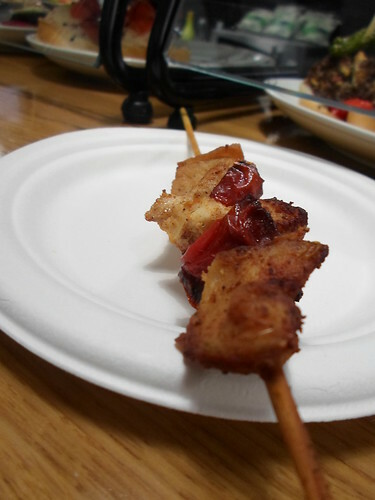 I went down the street and tried this skewer; for one Euro I wasn’t expecting much, but it was surprisingly good. A tiny bit dry, but otherwise smoky with a hint of heat. 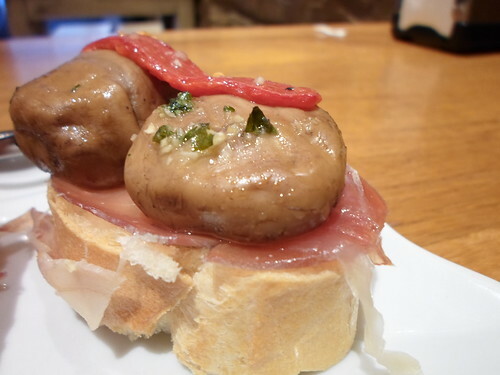 The marinated mushrooms made this pintxo over the top–it was good to start with, but it really felt like a meal because of the heartiness of the mushrooms. They soak them in olive oil, herbs, and plenty of garlic and when you put them in your mouth you begin to slide off your seat with happiness. Finally, I had this glorious pintxo. The tomato marmalade and the dusting of oregano gave this one a sweet edge to balance out with the nuttiness of the cheese and the Jamon Serrano. 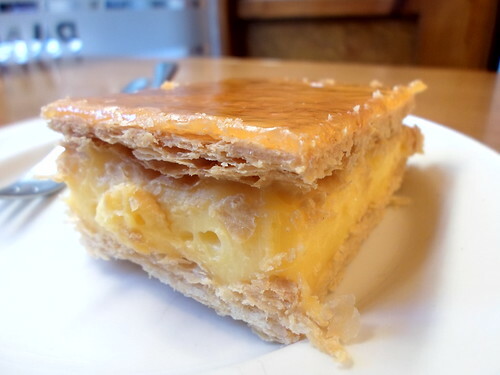 As an added bonus, I treated myself to a pastry with custard in the middle–it was cold and crisp and perfectly sweet. So, are you hungry yet? First time reading my blog? Click here. And don’t forget to subscribe! 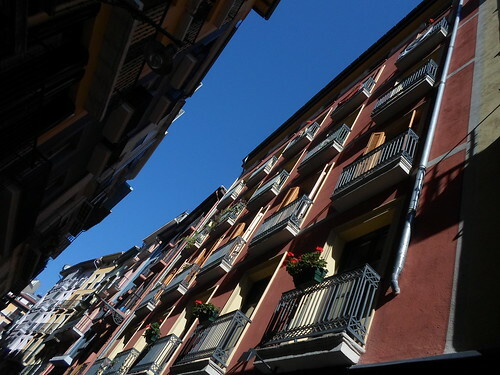 Posted in Camino de Santiago, FoodTagged happiness, Hemingway, Juego de Cinco, nom nom, Pamplona, photography, Spain, travelBookmark the permalink. I love that you slide off your seat with happiness over that mushroom pintxo! This is a wonderful foodie post – just what you need after that huge hike across the Pyrenees…….. Do I see a new calling for you when this adventure comes to an end?. New calling? I think not! Read this early post of mine or this one from San Francisco and especially this one if you love brunch. Just wait til I get to Logrono, the next big city on the Camino. One of my friends lived there for a year and there’s a street called Calle Laurel that has some incredible tapas bars. And I plan on spending an extra day there to nurse the hangover/food coma–I’m a very dedicated foodie! Okay – I am so sorry, and stand severely corrected ….. you are indeed a proven dedicated foodie! 🙂 I had not skipped that far back in your blog, but having done so I am pleased to know a little more about you – also picked up a little on your music appreciation. It is such a pleasure to be following along on your journey! Glad to share a little more of my life with you (and food pictures). Now you know where to go in San Francisco for the best quiche West of Paris, and where to go in San Diego if you want a great Cuban sandwich! Well, that’s probably the nicest thing anyone has ever said! As one of my Dutch friends told me, be careful about complimenting someone too much or they will start walking beside their shoes! I would have started with the dessert and probably stopped right there! It looked wonderful! It all was wonderful! I wish I had multiple stomachs like cows do!